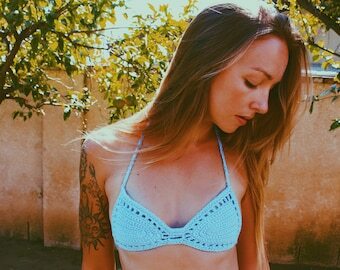 Hand crocheted Maisa bikini bralette, a must have for summer. 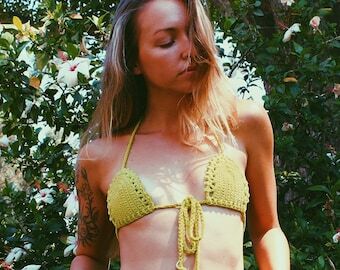 Wear in the water, or as a bralette with your favorite low cut summer dresses and blouses. 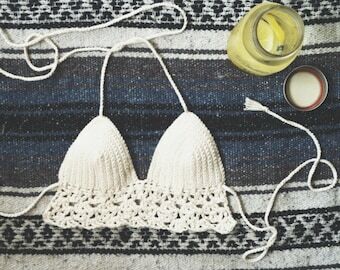 Cotton crochet is meant for water wear, it retains its shape however it does take longer to dry than normal swim materials. Made from %100 USA made cotton in White (pictured) or your color of choice from the drop down menu. This top features intricately detailed peephole cups cups with picoted details and swimsuit style halter and back string ties that allow for a more customized fit. Wear the bottom ties tied in the back or wrapped around the front. Each tie is finished with a signature Jayblue cowrie shell tassel! (Request shorter ties at check out if you don't want to wrap them). 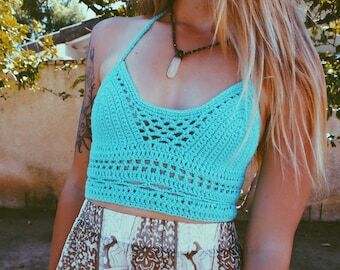 The seller is super pleasant and the bralette is perfect! Made this transaction easy and wasn't rude!! !